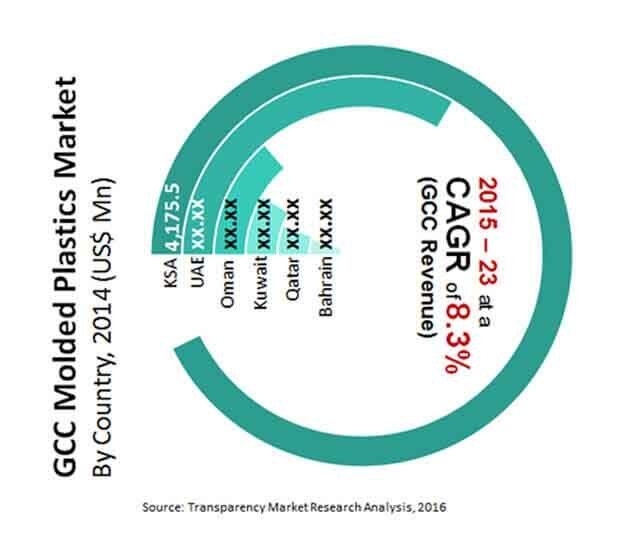 According to the findings of a recent report by Transparency Market Research (TMR), the molded plastics market in Gulf Cooperation Council (GCC) is highly fragmented, with ten leading companies accounting for merely 40% shares of the global pie in 2014. On the other hand, on the basis of geographical distribution, the GCC molded plastics market is consolidated, with Saudi Arabia accounting for 60% of the plastic converters while 15% belonged to the UAE. As for the new entrants, the report detects that since most of the prominent vendors have relatively smaller production capacity ranging from 10 to 50 kilo tons, higher production capability aimed at specific regional pockets will pave the way. As per the projections of the TMR report, the GCC molded plastics market will increment at a strong CAGR of 8.3% during the forecast period of 2015 to 2023, reaching a valuation of US$14.22 bn by the end of 2023, considerably up from its evaluated worth of US$7.19 bn in 2014. Though there are a vast number of suppliers of molded plastics in GCC, there also are plenty of untapped growth opportunities, and expansion strategies as well as improved product portfolio will help the companies to strengthen their stronghold over the competition. Based on application, the GCC molded plastics has been segmented into building and construction, automotive and transportation, packaging, consumable and electronics, and others such as furniture and toys. Among these, the packaging industry accounted for the maximum demand at 52% in 2014, and is expected to remain most profitable, reaching a share of 56% of the overall demand by the end of 2023. The prosperity of the packaging industry in Gulf Cooperation Council is a reflection of consistently improving trade activities and the growth of the industrial as well as consumer goods sectors. The products packaged with molded plastics undergo several development phases in order to comply with regulatory guidelines and the requirement of the end users. Enhanced performance against wear and tear, increased shelf life of food products, improved durability are some of the requirements that plastics need to meet for packaging applications. The population of this region has escalated quickly in the past decade, which has helped in creating manifold growth opportunities for molded plastic packaging market. The building and construction is flourishing in GCC as well, wherein molded plastic are used to manufacture rain water & sewage pipes, electrical conduits, windows & doors, gas distributions pipes, plumbing, tanks, flooring tiles & rolls, and others. The medical and automotive are also expected to maintain significant demand rolling-in in the GCC molded plastic market. Country-wise, the report studies the potential of molded plastic market in Saudi Arabia, Qatar, UAE, Kuwait, Bahrain, and Oman, and picks out Saudi Arabia as most profitable country, while the UAE and Kuwait are rated to expand the demand for molded plastic moderately during the forecast period, primarily gaining traction from the construction industry. Rapid growth of the packaging industry in the Middle East and the prosperity of the construction industry are two prominent drivers of the GCC molded plastics market, which on the other hand, is facing challenge from the unpredictable demand patterns of economic and political stability. Improved product portfolio to cater to diverse sectors and research and development are two key strategies adopted by the leading vendors to gain ground over their competitors. The popularity of lightweight materials and growing application in the medical industry is expected open new avenues for the GCC molded plastic market.